I had scallops in the freezer, just taking up space. What was I waiting for? I also had some cooked lentils to use up. 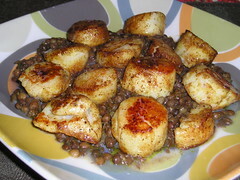 A quick google for “scallops” and “lentils” turned up a recipe on good old Epicurious for Moroccan spiced scallops on a bed of lentils. Hmmm, I did have some fragrant Ras al Hanout spice blend at home, that I’d ordered – from amazon! – for my nephew and for myself at holidays (along with some Harissa I haven’t tried yet). So I substituted the Ras al Hanout blend for the individual spices, and added some to the lentils as I reheated them (with some shopped shallot), and dusted the scallops with some more before quickly sautéeing them in olive oil. So quick, so easy, so yummy!